The world's most advanced broadcast grade production switchers! ATEM uses a familiar M/E style of operation so you get an instantly familiar workflow that's fast and easy to use. ATEM is affordably priced because you can start with the chassis only with software based control panel for Mac and Windows! If you then need a complete solution, simply add the ATEM 1 M/E or 2 M/E Broadcast Panel depending on your budget! The ATEM is a true broadcast grade panel with premium quality switches, faders and joysticks that are normally only found on the most expensive switchers available. ATEM even uses an FAA certified operating system for a true broadcast grade switcher! Everything you need for live production! Live production demands error free operation and the features you need for incredible production values. ATEM switchers include powerful creative tools such as DVE, upstream keyers, media pool, Photoshop(tm) plugin, preview transition and more! With ATEM you get the features you need for an incredible live production that will amaze your audience! For the ultimate in portability, every ATEM production switcher includes beautifully designed control panel software for Mac and Windows, so you can even use your switcher from your laptop! ATEM software control provides a professional M/E workflow control panel with parameter adjustments in simple to use palettes. You can manage the switcher media pool and set all adjustments, and switcher control includes full keyboard shortcuts! Only ATEM lets you start at a lower cost because you're not forced to buy a hardware control panel! Live production demands error free operation and the features you need for incredible production values. ATEM switchers include powerful creative tools such as DVE, upstream keyers, media pool, Photoshop(tm) plugin, preview transition and more! With ATEM you get the features you need for an incredible live production that will amaze your audience!. The production switcher for the internet age! ATEM Television Studio is a full broadcast quality production switcher with real time H.264 encoding so you can capture live events directly to files for internet distribution! ATEM Television Studio includes 6 video inputs with both broadcast SDI and consumer HDMI inputs for cameras and computers. You get software control panel, chroma keyer, two media player frame-stores, downstream keyers, transitions and more! Also works with ATEM control panels! Get the workflow of a traditional 1 M/E SDI switcher combined with a very portable compact 2 RU size and a software control panel you can run on your laptop! Includes 4 SDI inputs, 4 HDMI inputs for consumer cameras or computers, analogue input, and SDI, HDMI and analogue outputs including down converted SDI output and USB 3.0! You even get a complete frame resynchronizer on every input! You also get professional features such as stinger and DVE transitions, 6 keyers, multi view, built in media players and more! When you're working on serious live production, the ATEM 2 M/E Production Switcher includes all the features of the 1 M/E model in a compact 3 RU size. You also get 16 simultaneous inputs, SuperSource multi layering compositing engine, 2 multi view outputs, second M/E row, and a total of 6 Aux. outputs. 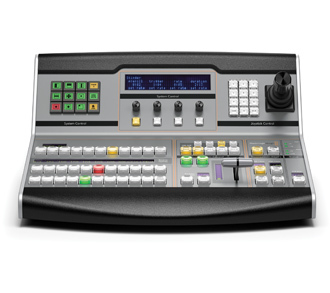 The ATEM 2 M/E Production Switcher also includes a software control panel, or you can purchase a dedicated 1 M/E or 2 M/E control panel for the ultimate solution that's traditional and easy to use in any live event! Note: SuperSource has not yet been implemented in the release version of the software. This feature will be enabled in the free 3.5 update coming soon. Get everything you need for cameras in live production with a single converter! Connect your camera's SDI or HDMI outputs for conversion to optical fiber, while your switcher program feed can be fed back via optical fiber for camera monitoring. ATEM Camera Converter includes an internal battery, talkback, tally, and microphone inputs! Tallies will be displayed when connected to an ATEM switcher to indicate their "on-air" status and you can even connect multiple interfaces together to increase the number of inputs and outputs. GPI and Tally Interface also works as a Videohub control panel without buttons and LEDs so you can make your own! (feature coming soon) Now anyone can connect to Videohub routers to control cross-points! Extend your SDI and HDMI cameras to an amazing 28 miles with talkback and tally! ATEM Studio Converter is the ideal partner for the ATEM Camera Converter. Connect up to four Camera Converters via optical fiber up to 28 miles away with bi-directional video plus tally and talkback! Connect your ATEM switcher program output to the ATEM Studio Converter and this is distributed to the four Camera Converters. Multiple Studio converters can be cascaded together when more than 4 cameras are needed. Studio converter can also be used as four independent SDI or Fiber to HDMI converters and four independent simultaneous SDI to Optical and Optical to SDI converters. Please check the Support pages to see complete Technical Specifications.